Iranian leaders have given defiant speeches, condemning U.S. sanctions and touting the country’s resilience, in the run-up to the 40th anniversary of the Islamic revolution. “The biggest economic pressure in the past 40 years on the Iranian nation has been plotted [by the United States]. 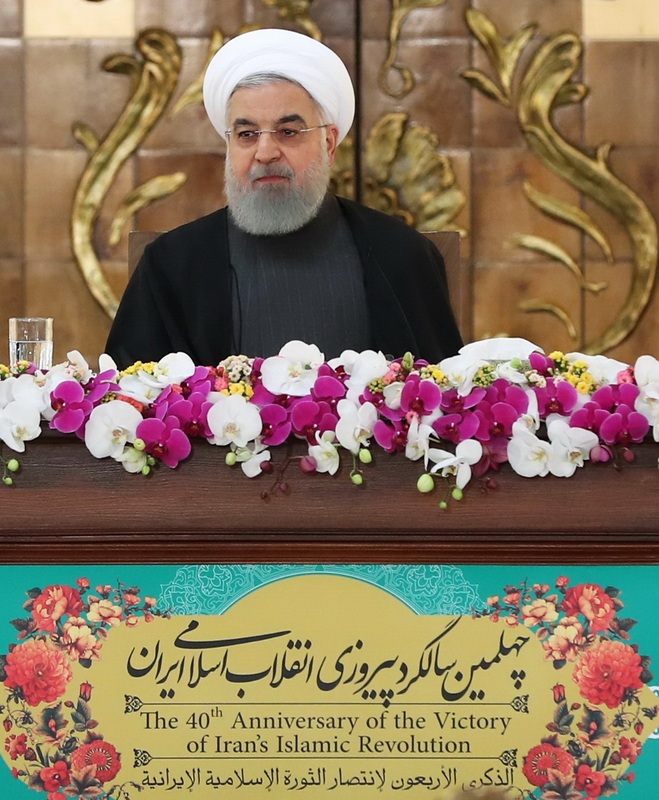 If we all stand together, we will be victorious in this stage as well,” said President Hassan Rouhani at a ceremony for renewing allegiance to revolutionary leader Ayatollah Ruhollah Khomeini’s ideals. Rouhani and other leaders condemned the United States for withdrawing from the 2015 nuclear deal, known as the Joint Comprehensive Plan of Action (JCPOA). Supreme Leader Ayatollah Ali Khamenei called the United States “the embodiment of evil.” He said the “down with the USA” chant is aimed U.S. leaders, including President Trump, National Security Advisor John Bolton, and Secretary of State Mike Pompeo. “We have no fight to pick with the American people,” he told Air Force officers on February 8. In a separate speech, Khamenei assured Iranians that they will overcome sanctions and other economic problems if they remain as vigilant as they were during the 1980-1988 war with Iraq. “Saddam [Hussein] was leveled to earth and he was sent to hell while the Islamic Republic continued to blossom. 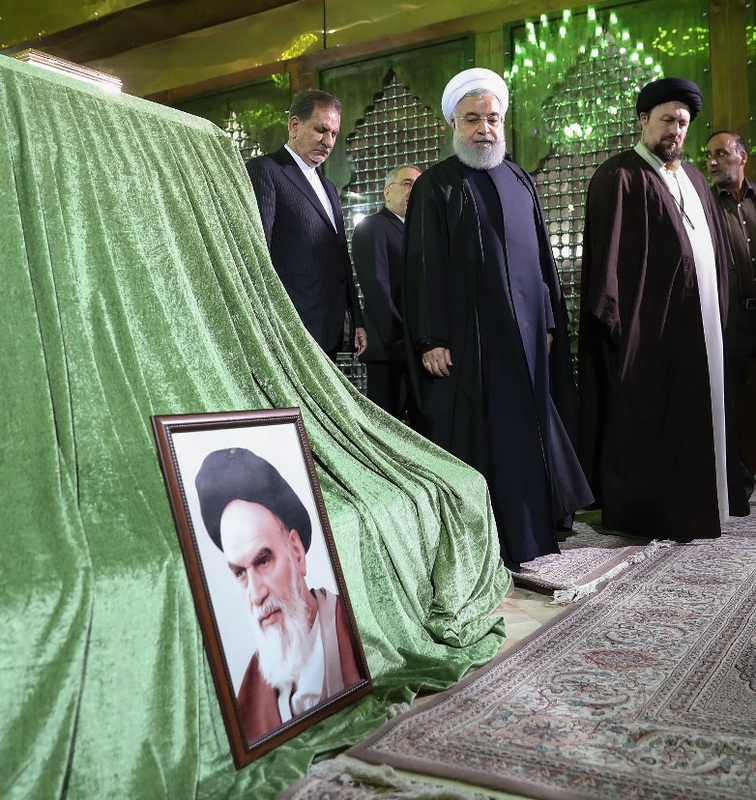 Our enemies too – the ones who are acting against us in the U.S., Europe, and the West – will go to hell as well, and the Islamic Republic will prevail, God willing,” he told residents of Qom in January. Iran also used the occasion to unveil a new cruise missile on February 2. The Hoveizeh surface-to-surface missile is a new addition to the Soumar family of cruise missiles that has a range of 810 miles, according to state television. The commemorations began on February 1, the anniversary of Khomeini's return from exile, and the start of the “10 Days of Dawn” which will culminate in nationwide rallies on February 11. The following are remarks by Iranian leaders on the revolution's anniversary. Feb. 11(22 Bahman) rally is a wonderful event; just like Revolution itself. Revolution celebrations are held in other countries, with military parades, etc. But that people take to the streets on cold winter days, march for hours, listen to speeches, for 40 years, is wonderful. “The Iranian nation proved its commitment and supporting the people of the region”. “If it were not for the support from the Iranian nation, the situation in Baghdad and Damascus would be different”. “Imam Khomeini is the greatest reviver of religion in our times and the architect of a revolution that achieved victory by relying merely on people. People believed in Imam Khomeini’s honesty. One of Imam Khomeini’s skills was that he proved that building a correct, fair system had a great value. Imam Khomeini believed that tyranny was the biggest wrong to be forbidden. Imam Khomeini interpreted the aspects of the religion that were less known to people. He aroused hope of a better future, an independent country and the ruling of people and Islamic rules. The hope Imam Khomeini brought to people mobilized the Iranian society, something that is unprecedented in the history. “He proved that ‘enjoining the good and forbidding the bad’ could also include domestic tyranny and foreign colonialism. Imam Khomeini was not afraid of foreign powers, but concerned about domestic division. Our system will be in danger if people have doubts about the two principles of Islam and Republic. Nobody can harm us as long as we follow the Supreme Leader. The U.S. Administration will definitely fail in its latest move against the Iranian nation. “Today, the entire world is condemning the U.S. conspiracies against the Iranian nation and support Iran in this regard. The U.S. has showed the same lack of commitment to Europe, China and international treaties and regulations. Most of our problems are because of the pressure from the side of the United States and its followers. #40YearsofFailure to accept that Iranians will never return to submission. #40YearsofFailure to adjust US policy to reality. #40YearsofFailure to destabilize Iran through blood & treasure. After 40 yrs of wrong choices, time for @realDonaldTrump to rethink failed US policy. "The enemies have attempted to block all our paths to power, and our achievements today have been earned against enemies' wish and desire." "The world arrogant powers have used all their power to stop the Iranian nation; they have laid siege on us and sanctioned us whenever we moved towards science, production, etc. They assassinated our scientists to prevent our progress, but we have progressed despite their will." "The Americans are sad about the rise of a powerful and great Iran in the region and today, the security established in Iran due to the glorious Islamic Revolution is not seen in any place in the Middle-East, and the Americans are well aware of this fact."